Why do I work to improve workplace communication? Why do I see intricate and immediate value in the infinite complexity of workplace communication? Why doesn’t the sea of variability that is working with other humans deter me from trying to help them succeed in making their workplaces better? The answer to all of these is A) I am a complete goober, B) I have some really old karmic debt and spending time with lots and lots of flummoxed people is how I’m paying it off, or C) I am just wired that way and I grew-up looking at the murals of Diego Rivera. While it can be argued that all three choices are true, the answer is C.
I have a very diverse work history. I have been fortunate enough to have held jobs working with academics, manufacturers, hoteliers, chefs, doctors, and frozen fish flingers; the list goes on from there. I can tell you exactly how each job related to the other, what each position taught me and how each has contributed to my writing and consulting work today. The most intricate thing that all of my jobs have taught me about is people – lots and lots of people who get up and go to work every day. I grew up in a suburb of Detroit. My family, like just about every family in Detroit, was connected to the automotive industry. My parents had professions that depended on car manufacturing both directly and indirectly: my mother worked in corporate sales for Michigan Bell (the Big Three need phones – as do all of their suppliers), and my dad is a mechanical engineer who worked for General Motors and ExxonMobile, among others, designing and developing the next new part that would make cars better. My parents are smart and competent people. They like to work. They also like art. They made sure that I had a solid understanding of the value of a good education, a strong work ethic and an appreciation of art. Going to the museum was a pretty common event for my family. Unbeknownst to many, The Detroit Institute of Art is one of the finest art museums in the country. 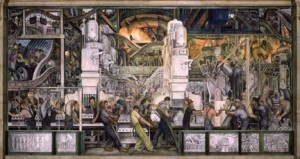 It is also the home of an entire room of murals by Diego Rivera entitled “Detroit Industry” which was a gift from Edsel B. Ford to the museum in 1933. So when I woke-up one recent morning in the middle of a dream with the North Wall of “Detroit Industry” flashing in my mind, I was not alarmed by its sneaky arrival into my subconscious, but intensely grateful. It is a perfect representation of why I like thinking about the variables involved in how people work together. The images are iconic: teams of men pulling levers and operating vast machines; a sturdy and dominant sense of structure, order and place; a sense of struggle and hardship; the strength of science and land and humanity; political and ideological themes running through the daily work of each person; all of these elements are present in this phenomenal work of art. Each scene in the four vast walls (the main lower panel on the North wall alone is over 17 feet high and 45 feet long – and that’s just the main panel!) is full of detail and nuance about industry and work life. I remember staring at these images as a kid and being mesmerized. As a six-, 10- and 13-year old, I didn’t really care about the Communist themes or the science versus religion debate that made the murals so hotly politicized when they debuted during The Great Depression. What I was drawn to was the idea that there was a lot going on in the world of work. I understood that there was more happening in those paintings than I knew about – the mood, color and images convey elaborate emotions and concepts very well. What I think I found appealing was that if I studied these murals, I could always learn something about how people worked together. 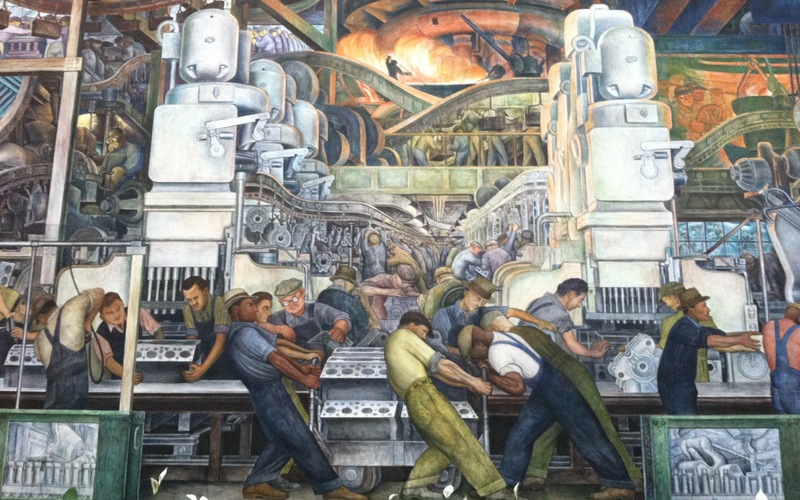 I also remember that I was very proud of recognizing that piece of art when I’d see it referenced someplace and thinking, “hey, that’s in my town and that’s what’s important to us.” The collective Us: the people in Detroit who valued work and its complexity. So, that’s why the answer to the above question is C. I am curious about people and the work we do. I like knowing about work and communication and the variability that exists in both that can aid people in making their workplaces better. I had the good fortune of being born to interested parents, near amazing art in a town that is itself an icon of the best of our culture’s working history. I feel so lucky. Pretty impressive Laura. Now I understand more of what you’re doing. Great photo too!